Happy Sunday, Everyone! It’s been such a gorgeous weekend. 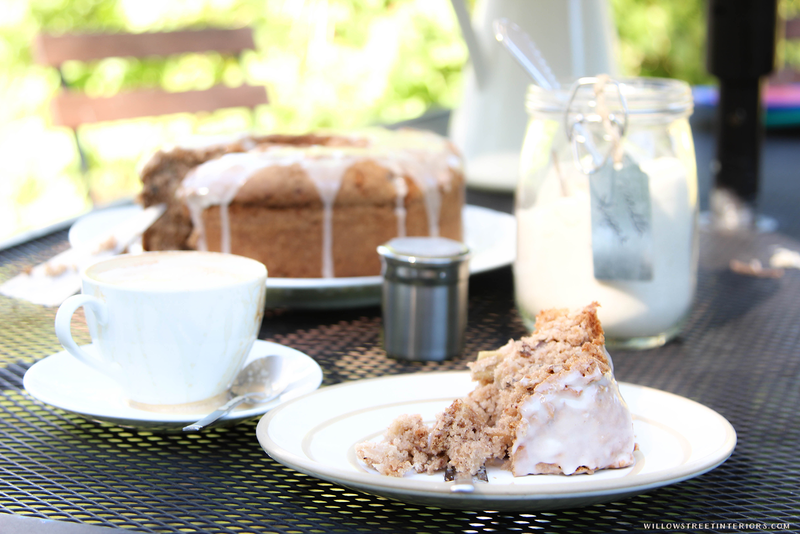 Perfect weather, a little relaxation and catching up with housework, breakfast on the porch – all in all a fabulous weekend that culminated in devouring this luscious cake (that also happens to be gluten free). My oldest daughter is turning 8 this week, and we’re having a little fall themed birthday party with family next weekend. I don’t know where the time’s gone, but it’s been such a blessing to get to see her grow into the smart, caring, nurturing little girl that she is. At breakfast yesterday, she asked to have apple cake at her party. 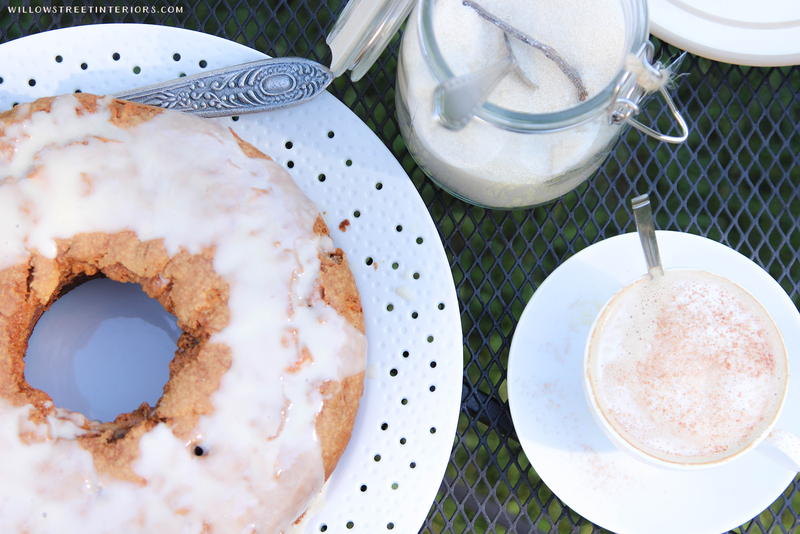 I’d never actually made an apple cake before but there was a delicious looking pin making its way around Pinterest a couple of years ago, and I’ve always kept it in the back of mind, waiting for the perfect excuse to try it out. Shugary Sweets is an entire blog devoted to insanely delicious looking desserts. Her recipe for Uncle Bob’s Apple Cake looks perfectly scrumptious, so when Jenna asked for apple cake, that was all the excuse I needed to finally give it a go. I went gluten free almost 5 years ago, after being told my thyroid was a mess and I would need to have it removed. I wasn’t keen on the idea of needing to be on replacement hormones for life, so I went to a naturopath who discovered I’m super sensitive to gluten. I went gluten free immediately and without changing anything else, my thyroid condition reversed in 6 weeks, along with other small things that I’d dealt with my whole life and just assumed were normal. I felt so much better, I never looked back! I cried a lot the first week after that diagnosis though. Cooking up delicious food in the kitchen comes in a close second to decorating for me, and after trying a couple different breads that literally tasted like cardboard, I thought I’d never eat good food again. But darn it, I wasn’t willing to give up the foods I loved and so I got to work reworking all of my old recipes. Plus, really good gluten free flour blends have gotten so easy to come by, it’s fairly easy to be gluten free these days. Aside from a couple of things, mainly real artisan bread (but I’m working on it!) there really isn’t anything that can’t be made gluten free that isn’t equally as good (seriously!) as their gluten containing counterparts. This recipe is no exception, and it is so simple to make gluten-free or gluten-full, whatever your preference! I substituted King Arthur Flour Gluten Free Baking Mix (not KAF gluten free flour) 1:1 for All Purpose Flour in Aimee at Shugary Sweets’ recipe, and that’s pretty much it! The recipe called for 90 minutes at 325, mine only took about 70 minutes. I also decided to use maple syrup in the glaze instead of honey. It’s seriously so good, you guys. You need to try this. And invite some company over. You do not want to be left alone with the leftovers! In a bowl, combine the apples, walnuts, vanilla, and cinnamon. In a separate bowl, sift together the gluten free baking mix, baking soda, and salt. Using a mixer with a paddle attachment, beat the sugar, oil, and eggs in a large bowl. Add in the dry ingredients and beat until completely combined. Fold in the apple mixture. 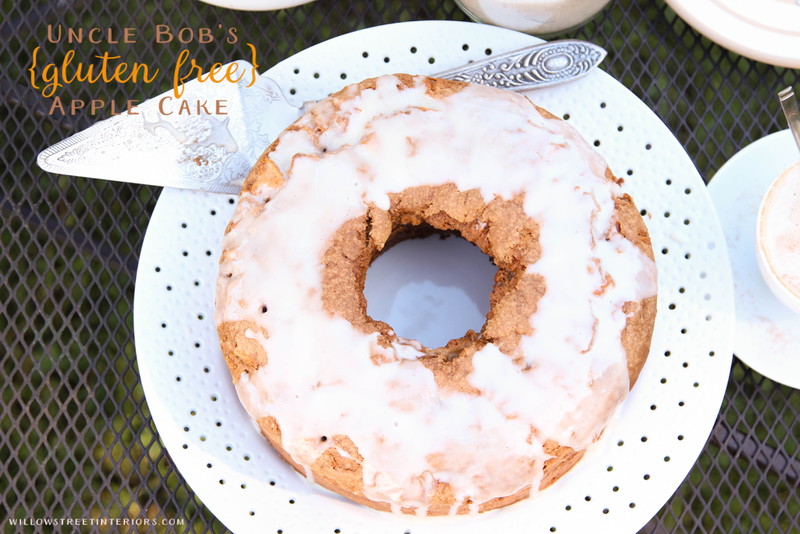 Scrape the batter into a lightly greased Bundt pan or springform tube pan.Bake in a 325 degree F oven for 1 hour and 10 minutes or until a tester inserted into the middle of the cake comes out clean. For the glaze, add all the ingredients to a small bowl and whisk until smooth. Drizzle over completely cooled cake. 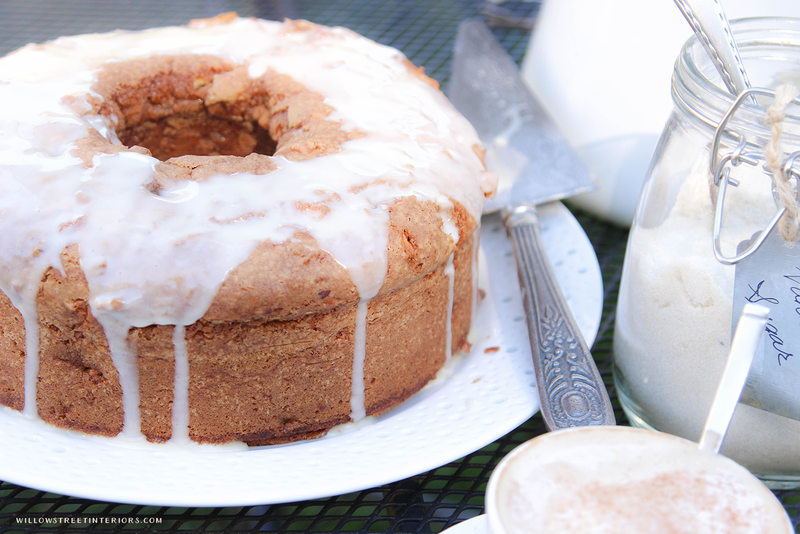 Drizzle the apple cake with some more of the maple glaze, serve and enjoy! #BareToBeautifulProject Inspiration + The Space I’m Making Over!